Jane Davies of Rupert, Vermont (population something in the region of 700) is conducting a campaign to save their post office, and a beautiful little post office like this deserves to be saved. 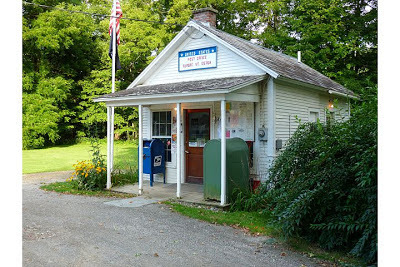 The idea is to increase the volume of mail handled by the post office by sending a postcard to Jane. Or a letter, or anything that comes by mail. I will attempt a handmade card and further attempt to be a little faster than the average time it takes me. The post office itself would make a lovely postcard. I have just visited the campaign page and my card is written and will be posted tomorrow! Postcard will be on his way tomorrow ! What a fabulous idea! I am terrible at sending out post but maybe a handmade card wouldn't be out of the question.